Zumeeta , honey and a cup of milk , I call it ZumeetaFlakes because it is the best thing to start your day with and believe me it's healthy 100% ,make 3abood dip it in honey eat it then drink little milk the will get mixed inside you and make you full the rest of the day, especially the Zumeeta my grandma makes , I don't know what she put in it exactly but it taste so good . I was wondering I want to know what else do you eat Zumeeta with , we eat it with Rub , Ruman , Bsal , Tamir , Lban , that's all I can think of right now but I am sure there are some other things you eat with Zumeeta . With some of butter, Un délice. by the way I saw some change on your blog template and now it's gone am I right or just dreaming? uuuugh! I think Zumeeta was food for when Libyans were too poor to afford 'real' food. Yuck! Even worse is ibsisa! I've tried it with butter too before it's nice but using the butter my grandma makes , and yes there are some changes in the blog cos I removed some stuff like the clock on top . Mrs Khadija I dont agree with you because what appears to be food of poor is actually rich in healthy stuff ,and second of all it really depends on who made this Zumeeta cos sometimes it's Yucky as you said , and for the Bsisa I dont like it that much too because of 7ilba which have this ugly smell . 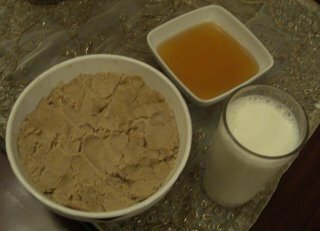 Khadija, it's seems that you have a bad idea about libyan food, in winter always Bsisa is my first thing to eat with date! Have you heard of the Zumeeta Shake? We get our Zumeeta from Zuara (contains no helba and sugarless). Blend at high speed and serve. Friends and family members who have ulcers swear by it. ( when used instead of an evening meal). Sounds like a good mix Trabilsisa ,I will try it and see how it tastes . Sorry for writing ibsisa instead of zumeeta in the shake ingredients(was in a rush as always ! )Have you tried it ??? I enjoy the Zuara Ibsisa and Zumeeta cause they both don't contain any 7ILBA. thanx trabilsia ,I still didnt try it and I think I will try both with bsisa and with zumeeta . For a few months now, 6 out of 7 days a week, I have zumeeta for breakfast with honey, milk, dates, even eggs sometimes. It's healthy and loaded with fibers which is a great option for breakfast. And for the lady who said yuck and it's not real food. So, using your logic for the "poor" people's food, should well all yuck pizza too?